The DRI-U is a DIN rail mount signal conditioner for thermocouple, RTD, resistance or voltage inputs, with 1800V isolation between input, output and power. 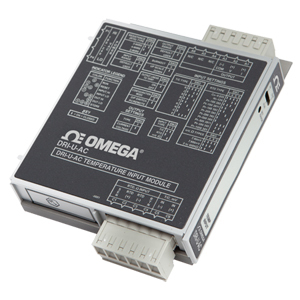 The user configurable input and output offers flexible, wide ranging capability for most temperature signal conditioning applications. The DRI-U is configured via DIP switch for Types J, K, T, E, R, S, B, N, or C thermocouples or Pt, Ni or Cu RTDs. Additionally, functions such as signal linearisation, up or down-scale burnout, number of RTD leads (2, 3 or 4) and voltage or current output are also set via dip-switches. Touch calibration technology allows easy field ranging for any of the thermocouple or RTD input types. For example, the dip-switch configured range for a J Type thermocouple is -210 to 760°C. Using a thermocouple simulator as a reference, the DRI-U could be ranged for 0 to 50°C or 0 to 500°C by simply applying the desired minimum and maximum input levels and pushing the range button to store the levels in non-volatile memory. Nota: An ACPB power rail is required to power the DRI-U-AC modules and is ordered separately.